OS X Mavericks is the third version of OS X to be sold primarily as a download from the Mac App Store. This has several advantages, the biggest of which is almost immediate delivery. With just a click or two, you can download and install the software from the online store. As with previous downloadable OS X installers, this one assumes that you're ready to go; it launches the OS X Mavericks installation app as soon as the download is complete. That's all well and good for many Mac users, and very convenient as well, but we like to have a physical copy of the installer, just in case we need to reinstall the OS or wish to install it on another Mac we own, without going through the download process again. If you would like to have a physical backup of the OS X Mavericks installer, our guide will show you how to create it. There are two different methods that can be used to create a bootable Mavericks installer. The first one makes use of Terminal and a hidden command that is deep within the Mavericks installer package that can create a bootable copy of the installer on any mounted bootable media such as a flash drive or external drive. It's only real disadvantage is that it doesn't work directly to burn a bootable DVD. It does work very well when a USB flash drive is a targeted destination. You can find out more about this method in the guide How to Make a Bootable Flash Installer of OS X or macOS. The second way and the one we will take you through here is a manual method that uses the Finder and Disk Utility to create the bootable installer. You can create the physical backup of Mavericks on a number of different types of media. The two most common are probably USB flash drives and optical media (a dual-layer DVD). But you're not limited to these two options; you can use any type of bootable media, including external drives connected via USB 2, USB 3, FireWire 400, FireWire 800, and Thunderbolt. You can also use an internal drive or partition if your Mac has more than one internal drive installed. For this guide, we're going to concentrate on creating a bootable USB flash drive to hold the OS X Mavericks installer. If you prefer to use an internal or external drive, the process is similar, and this guide should work just fine for you. A USB flash drive that's at least 8 GB in size; a larger flash drive is fine, too. In order to create a bootable copy of the OS X Mavericks installer, you must locate the InstallESD.dmg file that's hidden in the OS X Mavericks installer you downloaded from the Mac App store. This image file contains a bootable system and the files necessary to install OS X Mavericks. Since the installer image file is contained within the OS X Mavericks installer app, we must first extract the file and copy it to the Desktop, where we can then easily make use of it. Open a Finder window and navigate to your Applications folder. Look through your list of applications and locate the one named Install OS X Mavericks. Right-click or control-click the Install OS X Mavericks file and select Show Package Contents from the pop-up menu. The Finder window will display the contents of the Install OS X Mavericks file. Right-click or control-click the InstallESD.dmg file, and then select Copy "InstallESD.dmg" from the pop-up menu. Close the Finder window, and return to your Mac's Desktop. Right-click or control-click on an empty area of the Desktop and select Paste Item from the pop-up menu. The InstallESD.dmg file will be copied to your Desktop. This can take a bit of time because the file is around 5.3 GB in size. When the process is finished, you'll find a copy of the InstallESD.dmg file on your Desktop. We'll use this file in the next series of steps. With the InstallESD.dmg file copied to the Desktop, we're ready to create a bootable version of the file on a USB flash drive. 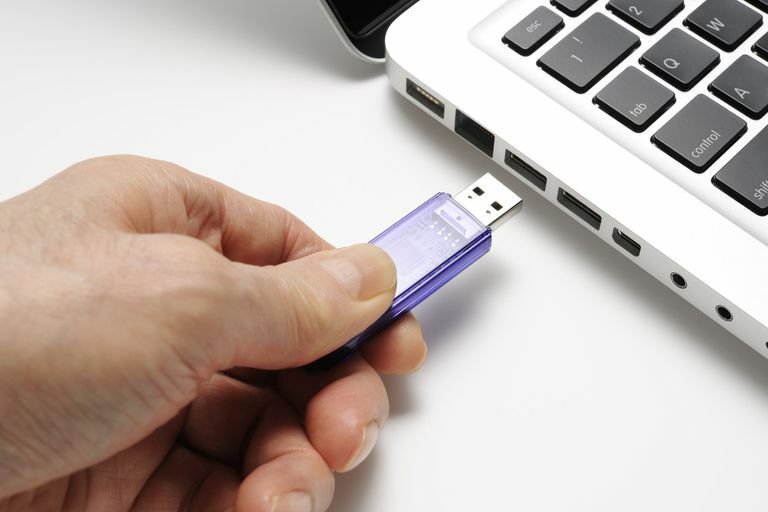 The next series of steps will erase all data on the USB flash drive. Before proceeding, make a backup of the data on the flash drive, if any. Insert the USB flash drive into one of your Mac's USB ports. Launch Disk Utility, located in Applications > Utilities. In the Disk Utility window that opens, use the sidebar to scroll through the list of storage devices connected to your Mac and locate the USB flash drive. The drive may have one or more volume names associated with it. Look for its top-level name, which is usually the name of the drive's manufacturer. For instance, our flash drive's top-level name is 30.99 GB SanDisk Ultra Media. Select the top-level name of your USB flash drive. From the Partition Layout drop-down menu, select 1 Partition. Click the Format drop-down menu and ensure that Mac OS X Extended (Journaled) is selected. Select the GUID Partition Table from the list of available partitioning schemes, and then click the OK button. Disk Utility will ask for confirmation that you wish to partition the USB flash drive. Remember, this will erase all of the content on the flash drive. Click the Partition button. The USB flash drive will be erased and formatted, and then mounted on your Mac's Desktop. The OS X Mavericks installer has a few hidden files that we need to be able to access in order to make the USB flash drive bootable. Follow the instructions in View Hidden Folders on Your Mac Using Terminal to make the hidden files visible. Double-click the InstallESD.dmg file that you copied to the Desktop earlier. The OS X Install ESD file will be mounted on your Mac and a Finder window will open, displaying the contents of the file. Some file names will appear dim; these are the hidden files that are now visible. Arrange the OS X Install ESD window and the Disk Utility window so that you can easily see both of them. From the Disk Utility window, select the USB flash drive's name in the sidebar. Drag the BaseSystem.dmg file from the OS X Install ESD window to the Source field in the Disk Utility window. Select the USB flash drive volume name (untitled 1) from the Disk Utility sidebar and drag it to the Destination field. If your version of Disk Utility contains a box labeled Erase Destination, make sure that box is checked. Disk Utility will ask for confirmation that you wish to erase the destination volume and replace it with the contents of BaseSystem.dmg. Click Erase to proceed. Supply your administrator password, if required. Disk Utility will start the copy process. This can take a bit of time, so relax, play a game, or explore some of the other articles on Lifewire.com: Common Mac Issues. When Disk Utility finishes the copy process, it will mount the USB flash drive on the Desktop; the name of the drive will be OS X Base System. You can quit Disk Utility. So far, we've created a bootable USB flash drive that contains just enough of a system to allow your Mac to boot. And that's about all it will do until we add the Packages folder from the InstallESD.dmg file to the OS X Base System you just created on your flash drive. The Packages folder contains a series of packages (.pkg) that install various pieces of OS X Mavericks. Disk Utility should have mounted your flash drive and opened a Finder window labeled OS X Base System. If the Finder window isn't open, locate the OS X Base System icon on the Desktop and double-click it. In the OS X Base System window, open the System folder. In the System folder, open the Installation folder. Within the Installation folder, you'll see an alias with the name Packages. Right-click the Packages alias and select Move to Trash from the pop-up menu. Leave the OS X Base System/System/Installation Finder window open; we'll be using it in the next few steps. Locate the Finder window called OS X Install ESD. This window should be open from a previous step. If not, double-click the InstallESD.dmg file on the Desktop. In the OS X Install ESD window, right-click the Packages folder and select Copy "Packages" from the pop-up menu. In the Installation window, move your cursor to a blank area (make sure you're not selecting any item already in the Installation window). Right-click in the blank area and select Paste Item from the pop-up menu. The copy process will take a bit of time. Once it's complete, you can close all of the Finder windows, and eject the OS X Install ESD image and the OS X Base System flash drive. You now have a bootable USB flash drive that you can use to install OS X Mavericks on any Mac you own. The last step is to use Terminal to hide the special system files that shouldn't normally be visible. Follow the instructions in View Hidden Folders on Your Mac Using Terminal to make these files invisible again.